After the Switzerland, Sweden, Finland and Denmark's dominance on the first two days of the European Youth Orienteering Championships EYOC 2013, the last day allowed to add the names of Russia and the Czech Republic to the set of the big winners. Individually, Sara Hagstrom won everything there was to win and she is, undeniably, the “queen” of these Championships. Succeeding the Czech Republic, Finland was the winner overall. The 15th edition of the European Youth Orienteering Championships EYOC 2013 came to the end this morning, in Vale Benfeito, Óbidos. An edition marked by the excellence of maps and terrains, an organization attentive and fully available to the 362 athletes from 32 countries presents, overcoming moments of enormous significance and value to the participants and, last but not least , warm weather and bright sunshine, to put even more colour and life on everyone's faces. Eagerly awaited, the Relay ended the Championships with an atmosphere of party and joy. Involving a total of 92 teams spread over four levels of competition, the courses were marked by the uncertainty about the winner until the final second, involving some surprising twists and a couple of unexpected results. In terms of twists, the most fantastic was led by Sweden in W18 Class, while the biggest surprise was eventually carried by Hungary, silver medallist in the W16 Class. As for the Portuguese, again, the last day of doesn't add something substantive in terms of results, and the M16 team achieved the best result, finishing in 12th position. 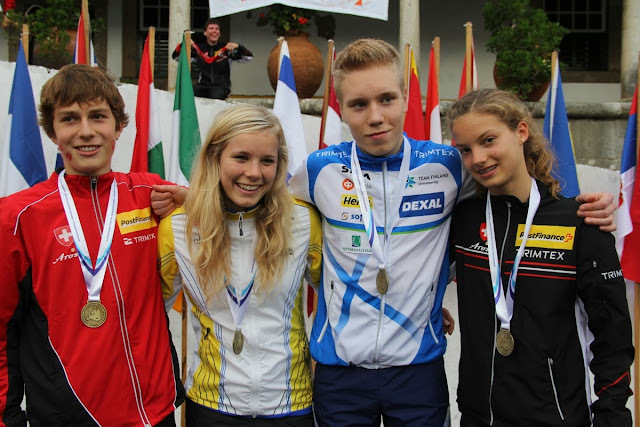 By winning two gold medals, Switzerland was the main figure of the first day of the European Youth Orienteering Championships EYOC 2013 which starts today in Obidos, Portugal. Beatriz Moreira, placed 9th in W16 Class, was the portuguese's best athlete. Óbidos was the venue chosen for the “kick off” the European Youth Orienteering Championships EYOC 2013. In a town that has in the chocolate one of its ex-libris, the courses were anything but “sweet” for the 361 athletes participating in the four competition classes. Made of streets and alleys, stairs and corners with much unevenness in the between, the map was a huge headache for the participants, requiring maximum concentration and a continuos focus on the map. EYOC 2013 Final Bulletin is available here. See the available photos of the terrain bellow. Read more: Terrain Photos Avaliable! Check out here the updated teams list that have already pre registered for EYOC 2013 in Portugal. SEA David Ales (CZE) will be in Portugal from 12th to 15th of July to check out all the work that has been developed so far since the event organisation has changed to Portugal. Check out here the teams that have already pre registered for EYOC 2013 in Portugal. Bulletim 1 & 2 is available here to download (PDF). EYOC 2013 website is now open.